Jayne Mansfield will always be remembered as one of Hollywood ultimate icons. The blonde, curvaceous bombshell burst onto the screen in a time of Marilyn Monroe and Grace Kelly. Despite the clear similarities to Monroe, her distinctive vocals, turbulent personal life, and continued wardrobe malfunctions made her a media sensation. Yet little is known about the women behind the drama and the camera lens. In new documentary Mansfield 66/67, the filmmakers aim to separate the fact from the rumours. Despite an interesting perspective, archive footage and interviews with those close to her, the film is a fractured mess that never really focuses on Mansfield as a person. Starting with the actress’s gruesome death, the film introduces Jayne Mansfield from her blonde hair, exaggerated figure and squeaky signature noise’s. The film charts her rise to fame, her multiple relationships to her fall from stardom and later connection with Anton Levey, (Head of the Church of Satan). With legend stating that she died from a curse placed on her last partner, what was her connection to the occult and Satanism? Directed by P. David Ebersole and Todd Hughes. The directing pair have previously worked together on Dear Mon, Love Cher. Mansfield 66/67 was made to celebrate the stars life, on the 50th anniversary of her death. The filmmakers interviewed those closest to Mansfield including director John Waters and co-star Mamie Van Doren. The film uses footage of Mansfield from her films as well as professional and personal photographs. With her looks and screen presence its clear why she became a star as the footage is iconic and the films subject is always amazing to behold. With multiply interviews the film begins to suss-out the hearsay from the real woman. The talking heads offer different and intimate takes on Mansfield as a person and icon and they are drastically overused. They also never feel matched to each other. The topic changes rapidly within each section and never feels like a coherent narrative. As the film progresses, sadly, it loses sight of what the subject is and, at times, strays from Mansfield completely. The film offers no real insight to her as a person and focuses solely on the more sensationalist elements of her life and death. The approach taken with this documentary is indeed unique. Told in titled sections, each part is intercut with dance pieces and performances that reflect the story being told. 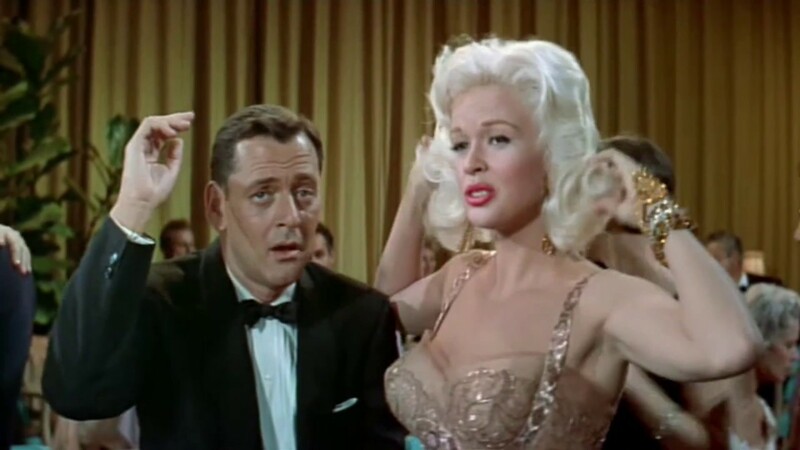 Men in suits and women with platinum blonde wigs, appear and disappear throughout the film. This is a unique take but as the style of the documentary is already fractured, these sections only add to the disorientation. Despite a unique look at a fascinating subject matter, the documentary fails to uncover any deepr insight into the iconic Jayne Mansfield. Even with its striking footage and interviews Mansfield 66/67 is a flat watch. Mansfield 66/67 is out on DVD & Blu-Ray now!